Regular readers of this blog may remember my comments regarding Ron Unz’s theory that East Asians have high IQ’s independent of time/nutrition/urbanization whatever it is that causes the Flynn Effect. Here is his original article on his theory of the “East Asian Exception” and my two responses are here and here. 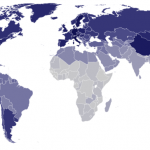 Secular gains in IQ test scores have been reported for many Western countries. This is the first study of secular IQ gains in South Korea, using various datasets. The first question is what the size of the Flynn effect in South Korea is. The gains per decade are 7.7 points for persons born between 1970 and 1990. These gains on broad intelligence batteries are much larger than the gains in Western countries of about 3 IQ points per decade. The second question is whether the Korean IQ gains are comparable to the Japanese IQ gains with a lag of a few decades. The gains in Japan of 7.7 IQ points per decade for those born approximately 1940 1965 are identical to the gains per decade for Koreans born 1970 1990. The third question is whether the Korean gains in height and education lag a few decades behind the Japanese gains. The Koreans reach the educational levels the Japanese reached 25 30 years before, and the gains in height for Koreans born 1970 1990 are very similar to gains in height for Japanese born 1940 1960, so three decades earlier. These findings combined strongly support the hypothesis of similar developmental patterns in the two countries. So, similar processes (height is of course strongly associated with nutritional quality) leading to the same pattern of steady IQ gains that have been observed for all Western societies. Theoretically, it would be very interesting to do a study of secular score gains in IQ in North Korea. It appears that height has not increased in North Korea since the end of the Korean war. However, it may be that the quality and number of years of education has improved. This experiment of nature could throw some light on the question to what degree nutrition/hygiene and education influence score gains.